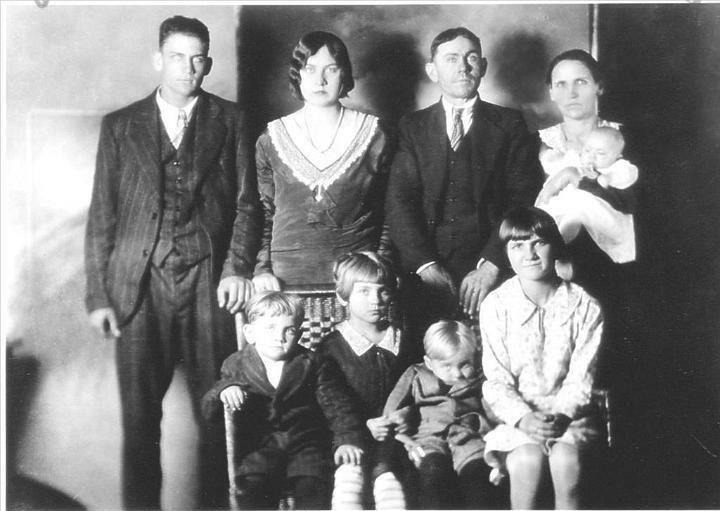 On December 25, 1929, Charlie Lawson murdered his wife and six of their seven children before killing himself in Stokes County. The tragedy occurred on their farm, just days after Charlie had taken the whole family into town, bought them new clothes and had them sit for a studio portrait. The eerie photograph, an unusual expense for a poor family of that era, indicates that Charlie likely considered the crime for some time before carrying it out. His motive remains a mystery. Charlie sent his 16-year-old son off on an errand before going to the tobacco barn where he shot and bludgeoned his two middle daughters, Carrie and Maybell. He then went to the house and killed the remaining members of his family, including four-month-old Mary Lou. He positioned the bodies by putting rocks under their heads and crossing their arms. Afterwards, he hid out in the woods, apparently pacing around a tree while neighbors and police gathered at the house. All there heard the gunshot when Charlie took his own life. The sole survivor of the tragedy, James Arthur Lawson, later married and had children before dying in an automobile accident in 1945. The murder inspired a number of songs and stories, including a 1956 folk ballad recorded by the Stanley Brothers. The story of the murders was recently featured on the PRX podcast Criminal.